Important events covered in this report. Cities often bear the brunt of natural disaster events due to the high concentrations of people and infrastructure, compounded by the vulnerability of both those people and that infrastructure. Building urban resilience - social, ecological, and physical - is a major goal for cities in order to address and buffer themselves from these shocks. 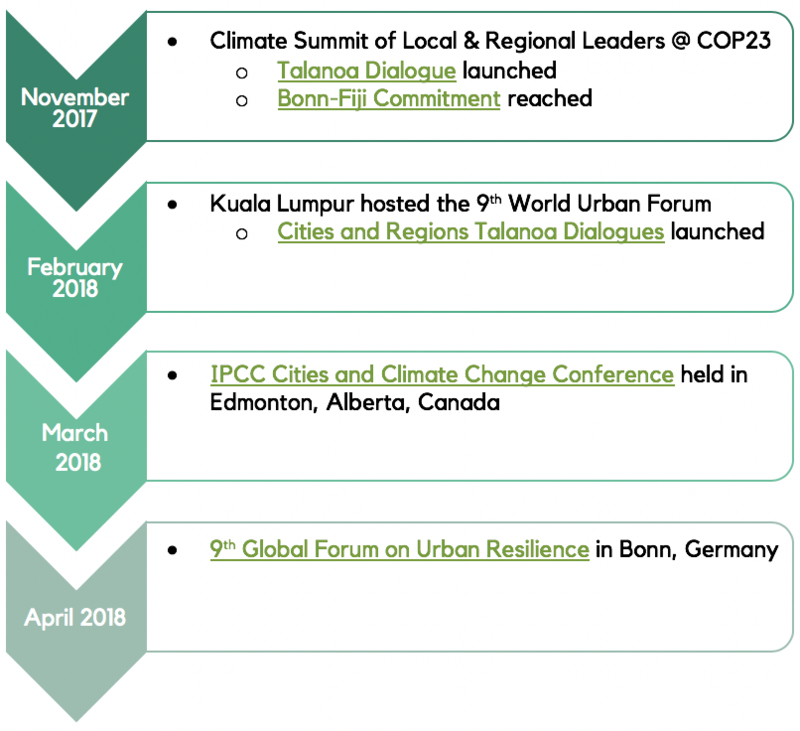 The ICLEI (International Council for Local Environmental Initiatives) Resilient Cities Report for 2018* assesses the major developments in urban resilience over 2017/18 and identifies opportunity areas for moving forward. *Download the full report from the right-hand sidebar. Key areas of the report are summarised below. See the full text for much more detail. The Talanoa Dialogue was launched at COP23 with the aim of inserting participation into the traditionally top-down and technical model of these conferences. Participants - irrespective of their positions - were all asked to address the following questions: Where are we? Where do we want to go? How do we get there? The straightforwardness of these questions and the honesty required in response builds trust and understanding amongst participants. The Cities and Regions Talanoa Dialogues (CRTD), launched at the World Urban Forum in February, focuses on local and regional practitioners answering these questions for their cities. Moreover, the Dialogue encourages discussion of the challenges faced. Participants in the CRTD agreed that one goal is the dissemination of tools, training, and expert assistance. Small Islands and Developing States (SIDS) face similar urban issues to larger metropolises around the world, including water and waste management, slum housing, and traffic. They also have to cope with climate vulnerabilities to prolonged and intense meteorological events (e.g. cyclones, droughts) and rising sea levels. As a result, their already limited resources and capacity to respond to the needs of their people for economic development are overstretched.For example, in 2016 Fiji suffered 44 casualties and USD 1.4 billion in damages as a result of Cyclone Winston, one of the most powerful tropical storms ever registered in the area. To further exacerbate the situation, SIDS’ fragile economies in many cases rely on fishing practices, tourism activites and coral trade that have often have damaging effects on the local environment, for example undermining the integrity of the reef system that acts as a buffer to intense storms. One potential response to this is for all SIDS to jointly enstate collective conservation regulations relating to tourism and to encourage ecotourism. Cross-SIDS collaboration is crucial - thus GLISPA (the Global Islands Partnership) was founded in 2006 to engage leaders in island action and strengthen major sustainable island commitments. Solutions need to include creating new sources of livelihood through ecosystem-based adaptation (EbA). In both Quelimane, Mozambique and Port Vila, Vanuatu, mangrove planting and regeneration have emerged as tools to build ecological resilience and to create new jobs. Nature-based solutions (NbS) are ‘actions to protect, sustainability manage, and restore natural or modified ecosystems, that address societal challenges effectively and adaptively, simultaneously providing human well-being and biodiversity benefits’ (IUCN, 2018). Mangrove maintenance and regeneration is one example of NbS. The Resilient Cities Report acknowledges that ‘NbS are multi-faceted, functional, flexible and offer an abundance of co-benefits while stimulating the local economy by increasing opportunities for revenues from sustainable practices’ (p. 10). Cities have increased engagement with NbS. CitiesWithNature, for example, is a global initiative that aims to connect cities and subnational governments to work towards urban planning that incorporates nature. With ~60% of the area expected to be urban by 2030 yet to be built, pursuing urban planning that integrates NbS into their adaptation schemes is crucial. (Secretariat of the Convention on Biological Diversity, 2012). CitiesWithNature and other initiatives aim to pool efforts among cities, to increase knowledge-sharing so cities can learn from each other and build upon existing ideas instead of reinventing the wheel. Cities consume two-thirds of the world’s energy and account for 70% of global CO2 emissions. They have complex resources flows that often originate in places far-removed from the cities themselves. Just like ecosystems and humans, they require energy inflows and waste outflows. The circular development and/or circular economy model attempts to address high urban consumption patterns through its focus on sharing, leasing, reusing, repairing, refurbishing, and recycling, in (almost) closed loops, where products and the materials they contain are highly valued. Thus, cities need to better understand their resource flows in order to integrate the circular economy model. One way to do so is through open access and open source data (see point 6). One major component of urban resource flows and consumption is food. Tools and frameworks have taken root to address resilience for food systems, and the relevant governance that must take place to build resilience. One such framework is the Sustainable Food System Transformative Framework (SFS Framework), which combines key policy levers, methodologies, tools, and collaborative activities across the food systems. Additionally, Food Policy Councils have been encouraged as a forum where stakeholders meet and build common ground. Resilience can also be built through socially cohesive communities that participate in the resilience agenda. Quelimane, Mozambique has integrated adaptation into its development approach that addresses poverty reduction and socio-economic development. Additionally, climate change has and will continue to drive emergency migration. Somalia has 1.6 million internally displaced persons (IDPs) who were forced to migrate following a severe drought. Local governments have instituted programs where IDPs and their host communities co-design solutions to adapt to new urban conditions. In this way, these communities can build trust by identifying common norms and values. Istanbul, Turkey has put citizen participation at the heart of its pilot Urban Transformation Project in Bayrampaşa District, which has s focused on active citizen consultation to plan communities that meet their priorities, such as - a mosque square, proximity to social infrastructure, green corridors, and commercial streets. Data-sharing and access is an important factor for cities and communities to better understand their vulnerabilities and opportunities. It is also a way to build public participation and a sense of ownership in communities. Finally, the report discusses the opportunities that could arise from better cooperation between local governments and the insurance community, suggesting that the co-design of infrastructure could be one avenue to do so. Further collaboration could emerge through social impact bonds and resilience bonds (see inset) - see page 18 of the full text for more information. Louisiana's coastal areas are at severe risk as sea levels rise and land subsides. The Louisiana Office of Community Development - Disaster Recovery Unit (OCD-DRU) is planning for a managed ‘retreat with dignity’ strategy which is centered around public participation. One such example of the resettlement plan for Louisiana’s Isle de Jean Charles. Only 320 of the island’s original 22,400 acres remain. The resettlement plan is attempting to develop and implement a geographically and economically feasible plan that also is culturally respectful of the island’s American Indian culture. While no resident will be forced to move, the reality of the island’s disappearance in the next few decades must be confronted. Port Vila, Vanuatu, has implemented a ridge-to-reef (R2R) program that focuses on mangrove restoration to promote food security in urban and peri-urban agriculture, urban forestry, and sustainable coastal housing and livelihood practices. The program interviews key stakeholders to gather information about ecosystem services and hosts training and awareness workshops that aim to build capacity. The city of Peterborough, United Kingdom created the Circular Peterborough Initiative committing to operate as a truly circular city by 2050, proposing seven steps to drive a more effective use of finite resources: Rethink; redesign; repurpose, reuse and share; repair; remanufacture; recycle; and recover (Future Peterborough, 2016). Mozambique has one of the longest coastlines in Africa, and nine transnational rivers empty along its coastlines. Quelimane, a port city, faces unique vulnerability as a coastal town that lies below sea level. The city has implemented a mangrove restoration project as a NbS to address frequent flooding. Furthermore, the mangrove nurseries are planted in the poorest part of the city and managed by those residents as a new means of creating livelihoods. Zamboanga City, located on the Philippine coast, is building resilience through NbS by identifying key local biodiversity spots. Spearheaded by the local government, this program aims to improve attitudes, competencies, and behaviours associated with biodiversity conservation, as well as promote adaptive governance through multi-stakeholder collaboration. Realising Just Cities, spearheaded by Mistra Urban Futures, is a project running from 2017-2019 that aims to address what justice means in different urban contexts, who are key stakeholders and role-players can enable or inhibit justice. The project began with a baseline study looking at terminology and definitions and relevant academic literature and policy discourse. The second phase of the project aims to fill the gaps from the first phase by further investigating current initiatives and their impacts taking place in various cities. Istanbul Metropolitan Municipality has integrated earthquake resilience and public participation in its Urban Transformation Master Plan. Their ‘Build-Transfer-Evacuate model’ pilot in Bayrampaşa seeks to build earthquake-resilience housing, transfer residents who are living in at-risk buildings, and then demolishing those buildings and replacing them with those services that citizens prioritized through active consultation with local government and stakeholders. The Palmiet River Rehabilitation Project is one example of cities harnessing data through the EPIC-N (Educational Partnerships for Innovation in Communication - Network). The Palmiet River Rehabilitation Project engaged young people and residents of the informal settlements near that river in conservation, rehabilitation, and restoration to improve community resilience. SDI supports and empowers urban poor in a process driven from below. The Know Your City (KYC) Campaign combines community-driven data and storytelling to communicate information about informal settlements from their own residents. DANE is analysing LandSat images and population data to address land use efficiency, which is one of the indicators for the SDGs.